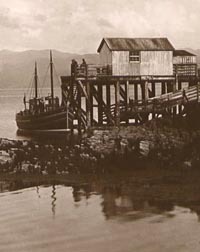 Welcome to the website of Comunn Eachdraidh Shlèite, the local history society dedicated to collecting and preserving the history of the parish of Sleat in the Isle of Skye. Membership is open to all – for details please go to our membership page. The News & Events page provides information on the society’s current programme of talks and activities as well as other events in the district. We welcome news from people whose families were originally from Sleat as well as contributions to our photograph and archive collections or even the smallest snippet of information about Sleat or its people. Please see our contacts page on how to get in touch, or use our guestbook. However we cannot answer genealogical questions or do family history research.Please see our links page for Skye-based researchers who can help you with this. The rest of the site is dedicated to recording the history of the parish. The Topics page focuses on specific themes; the menu will change as we add more subjects. Sleat at Sea looks at maritime subjects. Under Townships there is a gazetteer listing the townships in Sleat and their history while the Gallery includes part of our archive of photographs. We are still in the process of developing parts of the site so some pages may be incomplete or not yet available online. Please bear with us. This website has been part-financed by HIE Skye and Wester Ross and part-financed by the European Union under the Western Isles, Skye & Lochalsh LEADER+ Programme.